The Hero Indian Super League (ISL) 2018-19 season is in its business end as NorthEast United will host Bengaluru FC in the first leg of the first semi-final. The entertaining fixture will take place at the Indira Gandhi Athletic Stadium of Guwahati on Thursday. NorthEast United will be over the moon, making their first playoffs in the history of the league. Things went very well for the Highlanders right from the start, with the club finding key players at most departments. Bartholomew Ogbeche, Rowllin Borges and Mato Grgic have been all at their best to hand the team a place in the Top 4 for most of the season. Eelco Schattorie had the perfect plans in his books to seal 7 trumping victories throughout the season. NorthEast also had one of the best defences in the league, conceding the least number of goals - 18. Having qualified at the 4th position, the home game would be a real test for Schattorie and his boys. Bengaluru FC came into the season under a new coach - Carles Cuadrat. Though there were initial doubts regarding his appointment, Cuadrat was successful in implementing his plans well. BFC, who remained unbeaten till January, had some tough time towards the end of the season. After the international break, they lost 4 games, thereby denting their confidence. However, the Miku-Chhetri combination never lost its glamour and would again be the manager's trump card at the big stage. Finishing at the top of the table even after the gloomy matchdays was a job well done and they will be walking into the semi-finals with their heads held high. Mislov Komorski was earlier ruled out with an injury leaving a void in defence. And Gurwinder Singh, who was doing a fair job in his place, was sent off with a red card in the previous game. As a result, he will be suspended for the first leg. The latest news from the BFC camp is that Erik Paartalu will not return this season and the club have acquired the services of Alex Barrera as a replacement. All other players are known to be available for the playoffs. NorthEast United have two major pillars on whom the result of the tie could depend. Bartholomew Ogbeche in attack and Rowllin Borges in midfield will have a busy day at work against Bengaluru. Both these players have been the best performers of the team this season and would be wanting to repeat the same on the home leg of the semi-finals. Ogbeche has 12 goals this season and has been the reason for fear for every defender. On the other hand, Borges has done a silent job by scoring 2 goals and providing 4 assists from the midfield. Bengaluru FC will have their major duties assigned to Sunil Chhetri and Xisco Hernandez. With Erik Paartalu missing from action, Xisco will have to take up more defensive workloads. 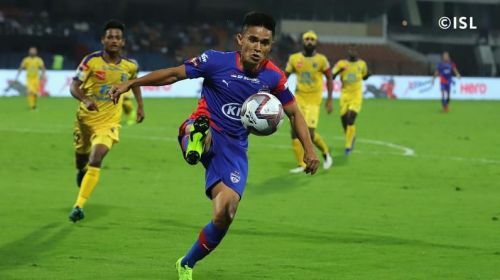 Chhetri has been playing a vital part as always, scoring 8 goals and 2 registering assists. If the Spanish man too can contribute his part well, BFC could very well come out victorious. The best two teams are coming face-to-face and thus it is extremely tough to make predictions. The tussle will be between the midfield of the two sides. With both the coaches likely to go for a double-defensive midfield and a single striker, it will be up to the players to prove their mark. In an action-guaranteed semi-final game, it might be Bengaluru FC heading home with the lead.